Spring can inspire many things, like spending more time outdoors, getting rid of clutter, and eating fresher foods. And while for most people that means adding more fruits and vegetables to their plates, it can and should also mean cooking with fresh, antioxidant-rich herbs. But herbs can be hard to shop for at the grocery store—bushels might be too large to use before the herbs go bad or confusion over how best to store them may dissuade someone from buying them at all. The solution: Grow your own fresh herbs at home in your very own apartment herb garden! Read on for the easy how-to, plus tips on ensuring yours grow heartily throughout the season. The most important thing to determine when creating your apartment herb garden is where to put it. Your location needs to get at least six hours of light per day. Most apartment kitchens tend to be near the door or opposite the windows, so this may require setting up a side table or a bookshelf beneath a living room window. However, you can get creative: If your tall living room windows stream sun into your kitchen, feel free to set up your pots there. Or if there’s a wall in your apartment that gets a lot of light, set up a hanging or wall garden (like this one). Can’t find a spot? Set up a fluorescent light next to your garden. Once you’ve chosen a location, the next step is picking a planter. Maybe you go with your standard plant pots, but you can also get creative with mason jarsor boxes. If it’s your first herb garden, starting simple with pots or jars that won’t require any special treatment might be your best chance at success. Also be sure to label your containers before doing any planting—you don’t want to accidentally add basil to your guacamole or cilantro to your pesto! For best growing results, purchase a potting soil mix as opposed to garden soil. In terms of care, water gently when the soil feels dry an inch below the surface and make sure you have a way to drain the container. If you’re new to growing herbs, try starting with basil, parsley or cilantro—they are the easiest to grow from seeds and can be harvested as needed, but under a third of the plant at a time to encourage regrowth. The intermediate gardener can try thyme, oregano, rosemary or mint, all of which are easier to start with a young plant than with seeds and require a bit more upkeep. Mint can grow fairly large fairly quickly, so make sure you have enough room in your mini garden. If your planting is successful, herbs can continue to grow for two or more years, providing your meals with bright, fresh flavors and health-promoting antioxidants. 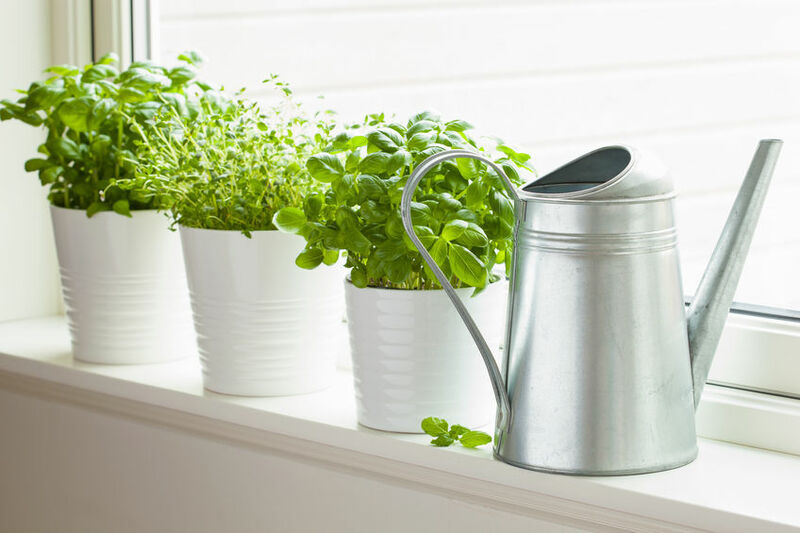 Do you have an herb garden in your apartment? We would love to see it! Post a photo on Instagram and tag @powerforlifefitness and you’ll receive a gift card to your local garden center!